It was a piece of writing in an old newspaper that I got my hands on while cleaning the drawers. The title of the article was on the lines of ‘He isn’t a mind reader.’ I was newly married and had known my husband for only five months by then, hence any kind of advice or lecture on marriage would lure me to read it in peace. This article was quite an eye-opener. It talked about how couples do not openly communicate their desires and secretly wish for their spouse to understand and fulfill them. But how could anyone do that? They are not mind readers. How true! This is how I learnt my first lesson in marriage – when you need something, ask for it. This may initially seem like demand but it isn’t. It is a wise and practical way to let your spouse know what you need and at what hour. 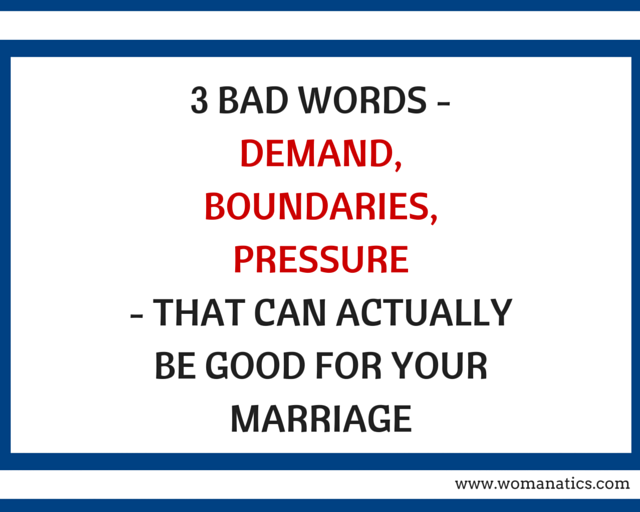 Here are three words or traits that are normally considered bad but if you look at them carefully and practice them in a sensible way, they can help you in strengthening your marriage. 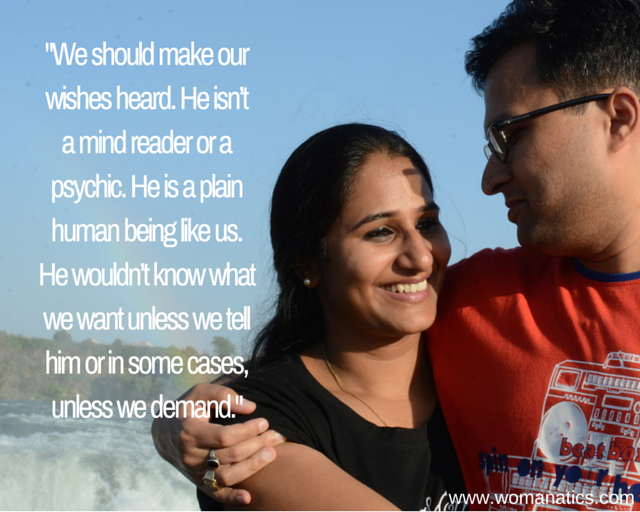 Demand – We have been taught to be the ideal wives and ideal wives are not demanding, right? Maybe. I am a clamorous wife and I admit it, openly. I demand time and attention from my husband. This demand of ‘having to spend time with me’ has now made him accustomed to my presence around him and so far we have never had issues of quality time. In the beginning he took the liberty of coming home late and even after being home he would be busy with his office files and office phone calls. One day I talked it out with him and explained to him that he is not meeting my ‘demand’ of spending time with him and getting my due of attention from him. No man likes to be a man who can’t fulfill his wife’s desires. My husband is no exception. Since that day, he makes a point to save his time from elsewhere and instead spend it with me. Not just with the matter of time, this demand has helped me in various other things. I demand that whenever my five year old pees in the bed, he changes her clothes. He does so, initially reluctantly and now willingly. I demanded that he shouldn’t entertain any phone calls post 9 pm and we now have an unsaid rule in the family – no phone calls post 9 pm. Point is that we should make our wishes heard. He isn’t a mind reader or a psychic. He is a plain human being like us. He won’t know what we want at a moment unless we tell him or in some cases, unless we demand. I would say – go ahead and demand. His time and attention are rightfully yours. I don’t ask for a huge solitaire or a world trip. I demand those intangible things that he would be happy to know are desired of him and would be happier to provide to me. Plus, all men want to desired. And demanding time from them is a good way to let them know that they are being desired and wanted. You may not have to do it the way a ‘demanding’ person is often imagined – shouting at the top of your voice. Do it gently and lovingly. Send him a text that reads, ‘Missing you. Come home a little early’ or ‘We haven’t spent good time lately, let’s go out tonight.’ Chances are he will come home running. Set Boundaries – I vividly remember the discussion that I had with my MBA friends during a session of evening drinks years ago. The group had three married couples and three single people. Being a single woman myself, I attentively listened to what the married folks had to profess. My Indian couple friends believed that marriage is like a fluid and thus a husband and a wife become one entity after marriage while my Mexican friend couple believed otherwise. They proclaimed that marriage is indeed a single unit but husband and a wife are individuals and thus they need to have some boundaries, else it gets too overwhelming at times. I am an Indian married to another Indian but I follow the Mexican advice. Boundaries are essential in every marriage. It is not that I have set a territory that I do not dare to cross or that we have a frontier where the other does not step on, it is just that we respect each others’ individual stream of thoughts. My husband shares almost everything with me and I do too with him but I also keep a small check on what I share with him. I tell him all about myself and my day and dreams but I hold some information within myself and this information is mostly related to stuff that is largely irrelevant and uninteresting to him. Or the stuff that is unimportant to him but close to me. I do not divulge to him if my friend’s friend is sleeping with somebody else. I do not ever reveal anybody’s secrets to anybody, even if it’s my husband. It is my virtue of integrity and I never break my promises of secrecy unless it is crucial for him to know. 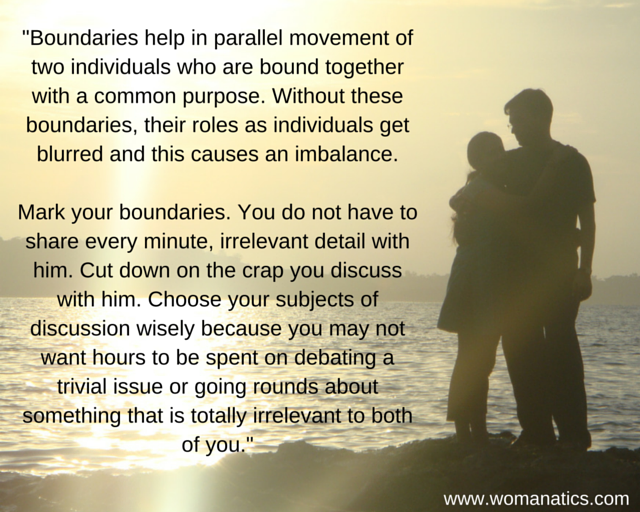 Boundaries help in parallel movement of two individuals who are bound together with a common purpose. Without these boundaries, their roles as individuals get blurred and this causes an imbalance. Mark your boundaries. You do not have to share every minute, irrelevant detail with him. Cut down on the crap you discuss with him. Choose your subjects of discussion wisely because you may not want hours to be spent on debating a trivial issue or going rounds about something that is totally irrelevant to both of you. 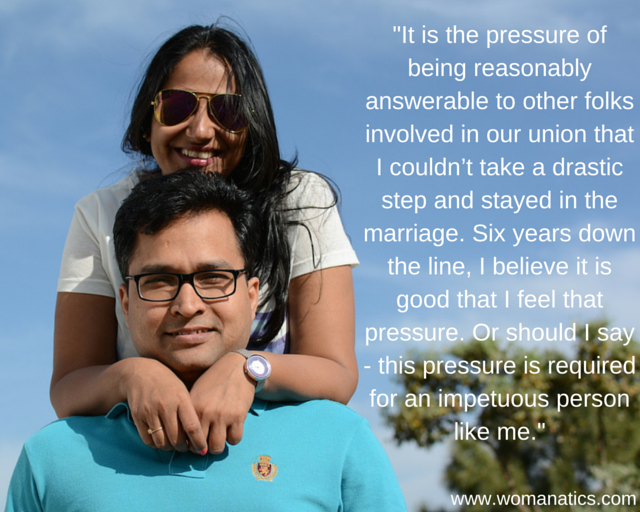 Pressure – Can any kind of pressure be good for any marriage? Yes. I can prove to you. Before you judge me or jump on conclusions, let me belt you with the fact that I am not talking about the pressure to stay in the marriage. I am hinting at the pressure that helps you in taking a third person view at your marriage and then making a wise decision. I am from India, a place that is known for it’s joint, big and closely knit families. Mine is an arranged marriage and marriages in India are not just about the man and the woman. They are also about families. Right after my marriage, I quit my job to move with my husband to a remote island in Southern India. This was too much of a change for me to handle in a month’s time. I had not anticipated the troubles before hand and now that I was living the change, I became bewildered. Even a minor, petty argument drove me crazy and I would think of walking out of the marriage. I loved my husband but I didn’t like the idea of living with somebody, waiting for him to come home, waiting to have food with him and worst of all – being responsible, accountable and answerable to somebody. I had lived a luxurious, free and wonderful single life. Now marriage had swamped me. Each time we had a small argument, I would bang the door and walk out of the house (pledging to never return) but I would come back sooner than expected. Whenever I walked out, my family and his family would flash in my head and I would think, ‘what will I tell them if they ask me why I walked out? That he got late from office or that he told me the food was a little salty?’ and I would come back. It is this pressure of being reasonably answerable to other folks involved in our union that I couldn’t take a drastic step and stayed in the marriage. Six years down the line, I believe it is good that we have the pressure. Or should I say ‘this pressure is required for an impetuous person like me.’ Good that I knew I would have to answer my folks and great that because of them I could never leave. Had I left, I would have missed the opportunity of being happily married to an awesome man. Next time you decide to step out of it, imagine you would have to answer somebody. If not your or his parents, maybe somebody, anybody who could ask you questions. And then think about it. Would ‘stepping out’ sound reasonable and wise to this person? No? Come back soon. But if you believe you can reason out with this person, go ahead. I, in no way, support living in an abusive or unhappy marriage. Every marriage is unique and so is every couple. What works for me may not work for somebody else. My marriage has become better and stronger than before because I didn’t let my desires go out of the window silently. I made them heard to him in the form of demands and he happily fulfilled. I set the boundaries to maintain my own sense of singularity that helps me in being in my right mind when things go haywire around me. I succumb to the mild pressure that I have on my head in the form of my family, friends and relatives so that I do not act impulsively and disrupt the placid setting of marriage. I am happy to have these bad terms being put to their best use in my marriage. Do you make the best use of any such bad trait? 10 Genuine Ways To Show Love To Your Husband Marriage is The Best Kind of Work: Ben Affleck Neither Love Nor Arranged: I Go For Happy Marriage!